Epidural Steriod injections are a common medical intervention for low back pain, but as the article below highlights they are not very effective and can carry great risk. Chiropractic offers a much safer alternative for the resolution of back pain and sciatica with conservative manipulation, therapeutic massage, postural retraining, balancing orthotics, core exercising, rehab therapy tape and other safer rehab therapies. The article below is from ChiroWeb.com. Considering that lack of evidence – not to mention the terrible 2012 outbreak of fungal meningitis / infections [see addendum below] caused by contaminated vials used for epidural corticosteroid injections – it is prudent at least to take a critical look at this procedure, particularly as it relates to conditions doctors of chiropractic treat. Armon C, Argoff CE, Samuels J, Backonja M. Assessment: use of epidural steroid injections to treat radicular lumbosacral pain. Report of the Therapeutics and Technology Assessment Subcommittee of the American Academy of Neurology.Neurology, 2007;68:723-9. Arden NK, Price C, Reading I, et al. 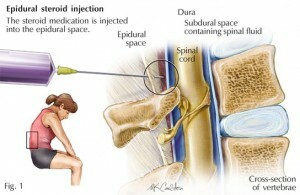 A multicentre randomized controlled trial of epidural corticosteroid injections for sciatica: the WEST study.Rheumatol,2005;44:1399-406. Airaksinen O, Brox JI, Cedraschi C, et al. European guidelines for the management of chronic nonspecific low back pain. Eur Spine J, 2006;15(Suppl 2):S192–S300. Chou R, Rosenquist R, Loeser J. ACP-APS Guidelines for Surgical and Interventional Procedures for Chronic Low Back Pain. Presented at Symposium 312 of the American Pain Society’s 27th Annual Scientific Meeting, Tampa, Fla., May 8, 2008. Friedly J, Chan L, Deyo R. Increases in lumbosacral injections in the Medicare population: 1994–2001. Spine, 2007;32:1754-60.